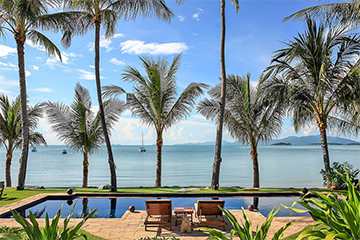 Luxurious Thai and Balinese inspired beachfront villa with spectacular views. Ban Haad Sai, which translates to 'house on the beach', is a large and luxurious beach front villa with spectacular views over Big Buddha Bay, the famous landmark golden Big Buddha, and the islands of Koh Som and Koh Phanghan beyond. The property opens directly on to a white sand beach from the pool and lawn, with a sheltered bay that is perfect for year-round swimming and stunning sunsets. The villa’s 7 pavilions offer over 800 sqm of living space, expansive decks, and patios, set within 1600 sqm of walled private lush garden. The floodlit 12m pool is surrounded by grass lawn, set on the palm-fringed beachfront, and is complete with a sunbathing area, loungers and parasols. The spacious air-conditioned lounge features sumptuous sofas, overlooking the beautiful sea views through sliding glass doors. The lounge backs on to an air-conditioned entertainment area, bar, and AV room with large plasma satellite TV/DVD. An integrated sound system with an iPod dock and mood-lighting set the scene for entertainment throughout the beachfront living area. Free broadband WiFi internet access is available throughout the property. A fully-equipped Western style kitchen is set alongside a Thai style outdoor kitchen. The kitchen serves a large dining room seating 14, a relaxing lounge area with plasma TV, and a large day-bed. Sliding glass doors open onto a wooden deck, with al-fresco dining set for 14 overlooking the garden, pool, and sea beyond. Luxuriously appointed and furnished with a wide range of Thai and Asian artifacts, Ban Haad Sai comfortably accommodates up to 14 guests in 7 bedrooms, all of which are air-conditioned.The bedrooms include 4 doubles and 3 twins, 6 of which with en-suite bathrooms. The 2 sumptuous master bedrooms overlook the sea, and feature spectacular indoor-outdoor bathrooms. DVD/CD sound systems are fitted in all bedrooms with USB access. At the entrance to the property is a covered car-port for 3 vehicles, and an elevated air-conditioned gym with cross trainer, bicycle, weights, sound system, and sea views. Adjacent to the gym is the 7th bedroom and bathroom. The resident full time staff includes a qualified Thai Chef, who can cater to your every need and can prepare a candle-lit beach dinner, a garden BBQ, or a stylish indoor dinner party. Alternatively, an eclectic range of restaurants and bars can be found within a short stroll along the beach. Located on Big Buddha beach on the North coast of Koh Samui, 5 minutes drive from Samui’s international airport, 5 minutes from Bophut, and Chaweng is 10 minutes away. Santiburi Championship golf course is 25 minutes drive. -Rates are exclusive of 10% service. -Rates are inclusive of airport transfers, continental breakfast, and in-villa chef service. -At low season, the daily rate at reduced occupancy of 3 bedrooms is $1000+ USD, or $1100+ USD for 4 bedrooms. -Minimum stay of 3 nights, except for Xmas/NY, minimum of 10 nights. -Two airport transfer are included each way, with additional transfers charged at $20++ USD per trip. *A security deposit of $750 USD is required on arrival, to be refunded on departure, less any damages or outstanding bills. 15% discount for any booking confirmed within 20 days of arrival. Applicable to 6 and 7 bedroom occupancy rates only, and cannot be used in conjunction with other promotions. Not applicable for Xmas/NY. 10% discount for booking made 150 days or more in advance. Applicable to 6 and 7 bedroom occupancy rates only, and cannot be used in conjunction with other promotions. Not applicable for Xmas/NY.